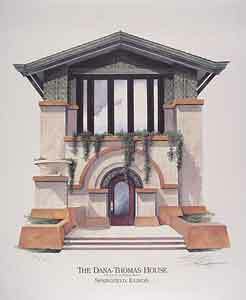 Often compared to a Japanese temple, the main entrance of the Dana-Thomas House with its upswept eaves, copper ornamentation and intricate frieze is an exotic departure from turn of the century architecture. 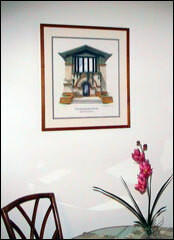 Our limited edition print is signed and numbered by Springfield artist Stan Squires. Printed in a series of 1700 on 80% Cotton fiber paper. Copyright © 2002-2010 Interactive Data Technologies.